Is there an equivalent of the Urbino studiolo's east wall at Gubbio? Perhaps the southeast wall? As one faces the window, the armor, weaponry and militaristic musical instruments are positioned to the left, while the lectern and other scholarly implements are generally to the right. Being at the centre, the placement of the window would then correspond with the city at Urbino. This window was originally covered with shutters, subsequently lost, that would most likely have been decorated front and back with intarsia. 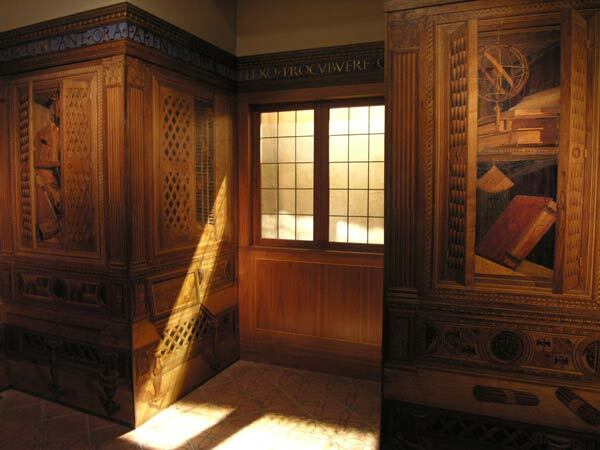 (Raggio, Gubbio Studiolo, 88). Although it is not known what subject occupied these missing shutters, an "ideal" city would have been consistent with the imagery adorning the door shutters throughout the duke's private chambers at Urbino.